The vision of the Paul Robeson Cultural Center (PRCC) is to develop a community where all students, especially students of the African diaspora, participate in guided educational discourse, leadership development, and out of the classroom engagement that cultivates meaningful experiences, fosters positive relationships, and facilitates inclusive spaces where individuals are able to be their authentic-self. The mission of the Paul Robeson Cultural Center is to foster community among Rutgers University–New Brunswick students, faculty and staff that involves everyone in educational, cultural, and social programs and services that facilitates learning and engagement. At the Paul Robeson Cultural Center, we are committed to reflecting on the experiences of historically underrepresented students, with an emphasis on students of the African diaspora, to help one another process, navigate, heal and advance within society and the university community. The Paul Robeson Cultural Center provides office and meeting spaces for registered student organizations and is home to the Black Voice/Carta Latina Newspaper. There is a computer lab with PCs for student use. The meeting and conference room areas are available for Rutgers University and community events. The center holds extended hours during examination periods each semester. The Paul Robeson Cultural Center’s activities and events include the following: speaker series, films, exhibits, musical and theatrical performances, academic achievement and leadership institutes, new student welcome programs and orientation, rites of passage celebrations for graduating seniors, diversity round table, tutoring programs, Kwanzaa celebration, job search and internship programs. 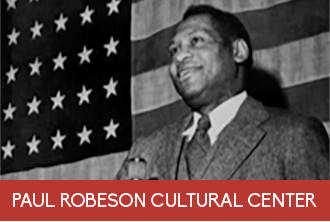 The Paul Robeson Cultural Center was established in 1969 in response to the challenge of providing a supportive atmosphere to increasing numbers of African-American students entering Rutgers University. In 1972, the center was renamed in honor of Rutgers’ esteemed alumnus Paul Robeson. The center has played a vital role in the Rutgers community by reflecting the rich cultural heritage of African Americans through programs that focus on the literary, cultural, and historic contributions of African-Americans to society. In 1992, the center moved from the College Avenue Campus to it’s current home adjacent to the Busch Student Center.